Throughout the year, ARCC full-time staff members are shaping the programs for the upcoming season. This group of former trip leaders, educators, world travelers, triathletes, and moms and dads, spend their days orchestrating and arranging the hundreds and hundreds of details necessary to operate ARCC programs in some of the most remote locations on earth. Regional and Gap Directors spend thousands of hours planning the programs in intimate detail so that our Program Leaders and Gap Instructors can focus their attention on their students, instead of on trip logistics. Directors are your “go to” resources when you have questions about specific trips or programs. They are fully involved with staff hiring, staff training, and trip support when programs are in the field. They are all united by their love of travel and adventure, and the desire to create positive experiences for young people. 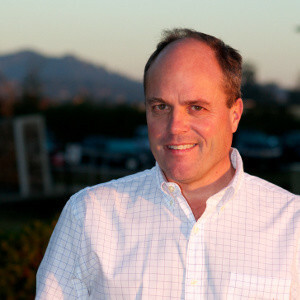 Scott has a diverse background in international travel, business, and adventure travel. He received a Bachelor’s Degree in Geology as well as an MBA from Dartmouth College. He has lived in Spain, Japan and Guatemala. Scott’s passion for the out-of-doors is reflected in his love of fly fishing and whitewater kayaking. He lives in Bend, Oregon with his wife, Kristin. They have two daughters: Campbell and Andie. What is your favorite place to have visited? I guess I’d have to say the last place I visited, which was Nepal. I’ve been a geologist, a garbage man, a lifeguard and an investment banker prior to joining ARCC, but I’ve been doing this job for 22 years and this is by far the best I’ve had. What was your first year at ARCC? Kristin has been involved with ARCC since 1993. Prior to joining ARCC, Kristin worked in Japan for 3 years for a Japanese marketing firm. Kristin graduated from Virginia Tech with degrees in economics and marketing. 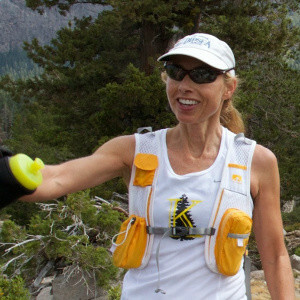 She is an accomplished distance runner and when she isn’t working, you’ll most likely find her trail running in the summer or nordic skiing in the winter. She is married to Scott and is mother to daughters Campbell and Andie. Spain. So much history at every turn. Great food. Beautiful landscape. I want to live there! What is your favorite ARCC Program? India. I love the idea of ARCC alumni students having some ownership over the India trip. They are the first ARCC students to travel to India. I like their sense of adventure and wanderlust. Running! I love the sense of freedom I have running the trails near our home. 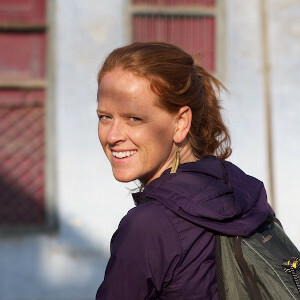 Sophia joined our Staff Full-time in 2012 after leading eight ARCC trips in Africa, Asia, and Latin America, including our East Africa Gap semester. Hailing from the East Coast, her passion for international relations and development brought her to D.C. for a number of years, before she moved West. A huge proponent of the Gap Year, Sophia spent her Gap Year volunteering in an inner-city high school in Philadelphia as a member of City Year Americorps. Calling this year one of the most impactful in her life, she will readily attest first-hand to the enormous benefits of taking a Gap Year. When not traveling, Sophia is an avid cyclist, photographer, tennis player, reader, and all-around outdoor enthusiast. Cuba. It’s a hidden gem! I felt like I had stepped back in time 60 years. The welcoming people, the vibrant colors, the antique cars, the sleepy town squares, the famous Malecon, the politics, everything… it was fascinating. That is such a hard question, but I’ve got to go with East Africa Gap. It’s so rich in culture, in adventure and in incredible projects, ranging from working with inspiring high school girls, to monitoring rhinos, to rafting on the Nile (woohoo! ), and so much more! Take me back. In 2016 I checked a huge item off my bucket list… 18 days rafting down the Colorado River in the Grand Canyon! It’s still on my bucket list though… I’m sure it gets more beautiful every time. Bryan has a passion for education and working with young adults. He spent two years in the classroom before jumping into the experiential education field. His passion and work have taken him all over the globe leading education and community service trips in California, Costa Rica, Nicaragua, Nepal, China, Indonesia, Thailand, Cambodia, and Vietnam. Bryan is passionate about creating an environment for life-changing experiences and hopes for each student to realize their potential to change the world. Each place I have visited has taken a piece of my heart, has changed the person I am today, but I think my time living and traveling through Central America really opened my eyes to the world beyond my personal bubble and set me on my current path of exploration. Peru has always been at the top of my bucket list so I think right now the Peru program has the most intrigue for me. What was your last job before ARCC? I was planning and running outdoor education and service programs for schools all over Asia. I lived in Hong Kong and traveled to just about every Asian country you can think of. Eben grew up splashing through ponds and pools as a competitive swimmer, lifeguard, and swim coach. 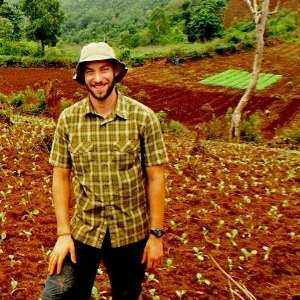 He first began his venture into experiential education when he embarked on a three month study abroad program where he literally circumnavigated the globe. After visiting exotic locations, he found himself leading teen adventure and community service programs over the summers, and working as an outdoor science instructor and program coordinator for several years. His outlook and approach to life has enabled him to live on three different continents, experience countless new things, and develop a drive to motivate others to do the same. New Zealand. I lived there for 8 months exploring all of the incredible things the country has to offer. It’s hard to find a destination with so much beauty and adventure packed into such a small space. My bucket list is constantly expanding as I explore more of the world and establish new goals. A few things on my list currently include visiting all 7 continents (only 2 left! ), writing a book, and building a house. Growing up, my passions focused pretty explicitly on swimming, a sport that taught me a lot about discipline and endurance. Since leaving the pool and working year-round in the outdoor education field, my passions have grown to encompass disc golf, rock climbing, snowboarding, SCUBA diving, skydiving, and freestyle rap. Margo was born and raised in the Midwest but has spent most of the past six years enjoying the beauty and expanse of the West Coast. She developed her deep passion for experiential and outdoor education studying abroad in high school with a program that combines experiential learning with leadership training, community service and outdoor skills development. 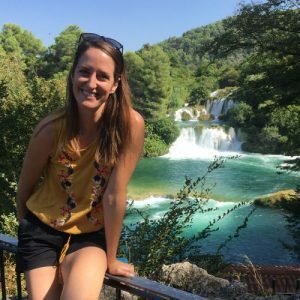 Margo joined the ARCC team in the office after leading numerous summer and gap programs for ARCC, and could not be more thrilled to continue supporting students in their journey to realize their potential, learn through travel and open their eyes to all the world has to offer. I am of course passionate about travel and adventure, but I also have a deep love for cooking (particularly my mom’s family recipes), learning languages, experiencing just about anything outdoors, and spending time with friends and family. Ever since I was in elementary school, I have been obsessed with Nepal. I even did a fourth grade project about it and have been reading books about Everest since middle school. So naturally, top of my bucket list is to go to Nepal to not only experience the culture, people and places there, but most importantly to make the trek to Everest Base Camp! I think one of my favorite places I have ever been is Guatemala. The beauty of the landscape, the richness of the culture, the amazing food, and the resiliency of the people have stuck with me for years and I look forward to the day that I can go back and rediscover this incredible country! Clarcie grew up outdoors on the rivers of the Colorado Plateau, where she first found her passion for adventure. 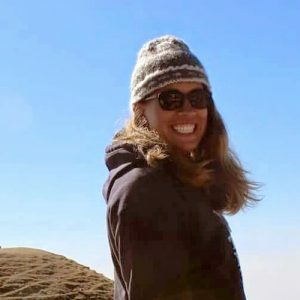 She guided whitewater expeditions for ten years and taught secondary English for six, then spent a semester traveling through Asia before finding ARCC. Through leading a Gap Semester for ARCC in 2017, she was able to finally marry her passion for adventure with her passion for education. She is now happy to be a part of creating lasting experiences for students from behind the scenes. Right now, I’m desperately wanting to explore the Middle East. I want to be immersed in the oldest histories of religion and community and I really want to eat the food. It’s a toss up between Cambodia and Nepal. In both places the people are so kind and so generous, though they have so little. I am passionate about the things that bring people together and get them to connect on a deeper level. In my experience, that’s campfires and river canyons, and sometimes being in an unfamiliar culture. 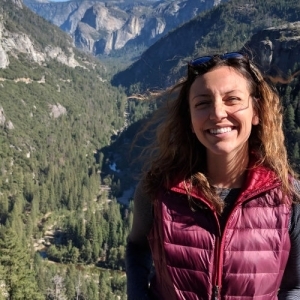 Mara’s two greatest passions are travel and being active in the outdoors, so she is thrilled to help students find their own passions while they are on our programs! She caught the travel bug early, and has traveled widely around the world to 36 countries. Mara studied Anthropology in college and still finds the study of, and immersion in, other cultures deeply rewarding. Closer to home in the Pacific Northwest, you’ll find her running and hiking on trails and near the water as much as possible. Cuba is close to my heart, I honeymooned there and was in awe of the sights of the country and how different it is from home. Thailand seems to be the place I think of most often. (I crave those mango smoothies even now!) Overall though, New Zealand will always be my favorite place- it’s a perfect country for outdoor adventures and beautifully scenic road trips that anyone would fall in love with! Right now the top of my bucket list is to hike the Annapurna Circuit, a 100+ mile trek in Nepal. I’ve also always wanted to take the Tran-Siberian Railroad from Moscow to Beijing, stopping at Lake Baikal (one of the most pristine and deepest lakes in the world) and in Mongolia along the way. One day I’d also like to make it to Antarctica- it will be my 7th continent. Travel, nature, sustainability, public lands, and good coffee. Finding non-harmful ways to achieve those passions is something I think about a lot so that, for example, I can recreate in ways that will still keep our natural areas intact and wild. 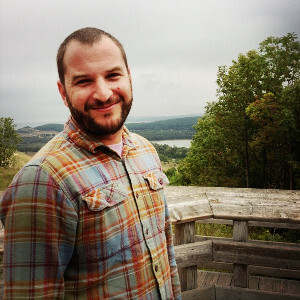 Brent was born and raised in the upper Midwest and grew up exploring the rivers, ponds, and forests of Wisconsin and Minnesota. He worked for over a decade teaching environmental education for middle and high school students around the country, including both the east and west coasts. 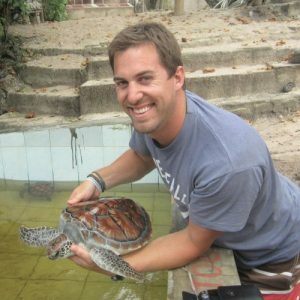 Brent started as a trip leader with ARCC in 2008 and has had the opportunity to travel to Costa Rica, Belize, Hawaii, East Africa, and southern Europe with ARCC programs. As a Regional Director, he now gets to plan these same amazing trips for future students and leaders! In college I studied abroad in Australia, New Zealand & Fiji. Australia was amazing! The landscape and wildlife are so unique, and the people are so friendly. Plus the marine ecosystems are absolutely stunning–scuba diving on the Great Barrier Reef is a once in a lifetime experience! I’ve been wanting to go back ever since. Isla Guadalupe, Mexico. It’s one of the best spots in the world to dive with great white sharks. Crystal clear blue waters, 200′ visibility underwater, and huge sharks the size of SUVs cruising around! Nightmare fuel for some, but one of my dream destinations. Wildlife and the environment, especially marine conservation. I studied marine biology in college and it’s always been a passion of mine. Travel, adventure, and being outdoors are near the top of my favorite activities list as well. Born and raised in Colorado, Emily grew up playing sports and exploring the Rocky Mountains. A passion for marine biology took her to the East Coast and opened up new spaces to explore and learn from. 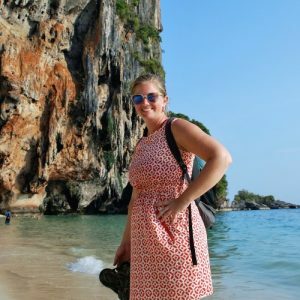 Emily’s experiences as a Peace Corps Volunteer in Mozambique, a gap year Program Leader with Thinking Beyond Borders, and a marine science educator in southeastern Louisiana have shaped the way she interacts with the world. She is excited to join the ARCC Gap Team and to find new adventures in Bend! I am passionate about travel, cultural immersion, marine science (fish in particular) and global environmental issues like climate change, land loss, and overfishing. I don’t think I can pick just one as each place has made a unique impact on my life but I’d say my top three are Mozambique, Rwanda, and Thailand. Antarctica! It has always been a place I wanted to visit although ideally I want to go as a part of a research expedition. 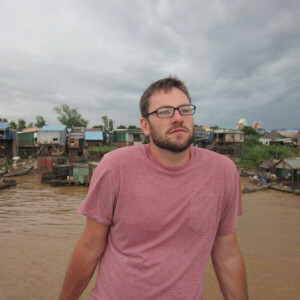 Jacob joined ARCC in 2015 after working with a broad range of non-profit organizations spanning causes from rainforest conservation to human rights and services projects. Jacob is a graduate of the University of Colorado, where his love for the outdoors was incubated and is an avid skier, hiker and mountain biker. Jacob lives in Bend, Oregon with his wife Deirdre and son Tommy. I love Rome. It’s amazing how it changes from a modern city to historical landmark as you round one corner to the next. I am a big fan of all the Costa Rica programs. They do such a nice job of blending service with adventure in an amazing country. I’ve always wanted to see all of the national parks.